The Bruno Elan Stairlift (Straight Unit) is now the global benchmark for style, performance and affordability. Two decades of Bruno research has provided a simple, yet elegant solution for traversing one floor to another in your home. 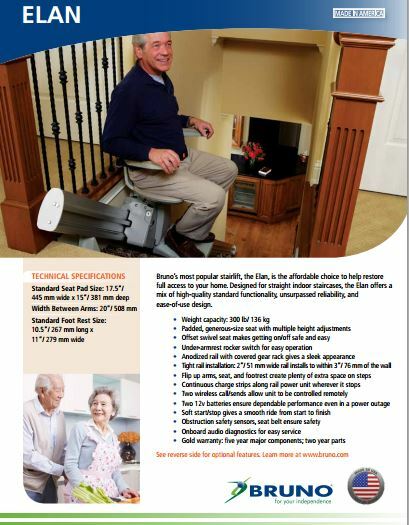 The Elan Stairlift is the quintessential value stairlift for today, and tomorrow. Pacific Mobility Center now offers the Bruno Elan for our Southern California customers. Please contact us for additional details! New Arrival! A ‘Flip-up’ folding rail option: if there’s a door, obstacle or hallway at the end of your stair lift rail, simply flip up the bottom section of the rail for easy access and added safety.